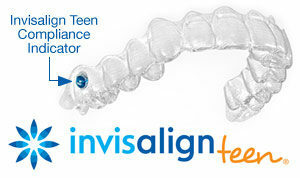 I-Ortho is proud to be able to offer Invisalign Teen to adolescent patients. If you have a teen that is in need of orthodontic treatment but isn't wanting to go the tradition route of braces, read below and learn more about our clear aligner system for teens! A new orthodontic appliance is transforming the way you can improve your smile. The technology, Invisalign Teen®, is made of invisible, removable aligners, specifically for teenagers. This orthodontic option may be the best for you if your treatment can utilize Invisalign Teen. You can eat your normal diet and clean your teeth with this basically invisible appliance. Could Invisalign teen work perfectly for you? If it fits in with the type of orthodontic treatment you need. In some instances, traditional metal braces are most successful and still extremely common for teenagers. Invisalign teen is changing everything for teenagers since the alignment trays have been modified for this specific age group. The clear aligners are plastic trays that cover the top and bottom teeth. The process transitions you through several stages of aligners that will move your teeth into proper alignment. Invisalign teen works by making customized trays through a computer program that factors in how to move your teeth compared to how they are currently. Each aligner lasts for two weeks, mildly shifting your teeth. Then you transition to the next trays that adjust your mouth again. These small incremental movements make a huge difference. The Invisalign system requires that you wear the trays for 22 hours per day. This process still allows you to remove them for meals and social occasions. But even when the trays are in, they are nearly invisible and are much more aesthetic that traditional metal braces. In addition, the clear aligners offer even more benefits. One advantage of the trays over metal braces is that you can brush and floss your teeth with ease. Invisalign teen can be taken out so you can clean every area in your mouth, just like you already know how. With traditional braces, it is hard to clean around the brackets and wires, resulting in less effective oral hygiene. Many people that wear metal braces complain of pain in the cheeks and gums from the metal brackets and wires. Thankfully, the plastic trays rarely result in irritation. And you will never have to see the orthodontist to reinsert a wire or mend a busted bracket. There is no need to change your diet either. You just take out the trays when your eat. Invisalign has transformed adult smiles for years, but only for a recent amount of time have orthodontists normally suggest Invisalign for teenagers. This is because of two reasons. First, teenagers might not wear them for the minimum 20 hours a day they need to work properly. Moreover, all of the teenager’s teeth may not have come in yet and this might affect the preplanned alignment of the teeth. Now Invisalign teen has the technology to prevent these issues. Compliance indicators are built into the clear trays. They are colored dots that lighten after wearing the aligners, indicating how long the teenager keeps them in. Also, aligners for teens have eruption tabs in the plastic that leave room for teeth that have not come in yet. Currently, more teenagers and adults are turning to Invisalign because it is the orthodontic treatment that most adequately fits their lifestyle. How about you? Visit our office and see if Invisalign is perfect for you.